Don’t miss out at this year’s Westbury Festival! This entry was posted on Tuesday, September 11th, 2018 at 12:26 pm. WESTBURY Music and Arts Festival kicks off next week with a whole host of activities, spread across two weeks, with over half of them free to attend. The annual music and arts festival, which is now in its 11th year, will run from Friday 21st September to Sunday 7th October and features a programme of events with something for everyone including music, crafts, tours, art and comedy. Pre-sales of tickets are looking to be the best ever at this stage with some looking to sell-out completely, so organisers’ advice is don’t miss out. You can purchase tickets online via www.westburyfestival.org.uk, by phone 03336 664 466 or in person from E J Crafts on Maristow Street, with cash sales only. 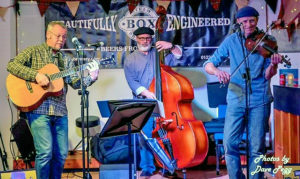 The official opening night event will be on Friday 21st September at 7.30pm at the Laverton with Dr Zebo’s Wheezy Club – an acoustic swing trio who were welcomed back after their hugely popular set last year. Their music will make you want to tap your feet, or even get up and dance! Tickets are £8. The event will be followed by two weeks jam packed with entertainment. A full round up of all the events can be found on pages 22 to 25. Still in the dancing mood? On Thursday 27th September, you are invited to a tea dance followed by the film showing of ‘Shall We Dance’ at The Laverton. The event will have you up and dancing to Swinging Cymbals with Mike and Angie Dale with all styles of ballroom and latin, interspersed with popular dance sequences, so there will be a dance for everyone. If dancing is not your style, you can watch the dancers, enjoy the tea and the see the 1937 film classic ‘Shall We Dance.’ Tickets are £5. Are you more of a singer? Grab an opportunity to join the Bath Gilbert & Sullivan Operatic Company and help them present ‘Scratch’ Pirates of Penzance, a light operetta. You will spend the afternoon with the professional soloists and musicians who will be on hand to accompany and guide you through the songs before you perform it to guests, family and friends in the evening. From 3.30pm-5.30pm, rehearsals take place in the Methodist Church on Station Road before the 7.30pm performance. If you would like to take part in the singing and performance, tickets are £10, if you would like to watch, tickets are £5. There are plenty of activities for children too including rhyme times at Westbury Library which are free sessions every Friday morning from 11- 11.30am. as well as a circus workshop on Saturday 6th October from 10am at Westbury Leigh Community Hall. Tickets are £5 per child or £8 for two siblings. Don’t miss the daily ‘Little Lunch Music’ recitals in All Saints Church, running from 1pm-1.45pm which feature different musicians each day. They start on Monday 24th September with cello duet Theresa Cole and David Garcia. They are free to attend, with some events attracting over 300 people last year.